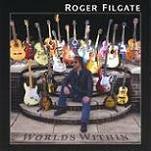 Review: "Filgate, Roger: Worlds Within" - Sea of Tranquility - The Web Destination for Progressive Music! American guitarist Roger Filgate has played in numerous bands from coast to coast over the years, the most notable being the British classic rock band Wishbone Ash where he played alongside founding member Andy Powell for a brief period in the mid 90's. While a large majority of instrumental guitar albums tend to either be one dimensional or self serving platforms for players to show off their chops with an excessive amount of masturbatory guitar solos, it's rather refreshing to come across a player such as Filgate who displays neither of these qualities. His latest solo effort entitled Worlds Within is a fantastic, multi-dimensional record that incorporates many different styles of music in addition to demonstrating his all-round versatility as a player and songwriter. Over the course of this diverse, twelve song disc Filgate seamlessly shifts gears between blues and country tinged riffs, classical, jazz, and progressive rock. Basically the idea here was to incorporate many different 'musical worlds' and have them peacefully co-exist on the same record. The challenge with creating a record such as this is not to have it sound contrived or have it come across as being diverse just for the sake of being diverse. Thankfully there are no such concerns on World's Within as Roger doesn't turn in one of your typical 'guitar slinger' albums. The listener is treated to a different flavor with each track. "Eastcoast Boogie" and "The Bulldog Blues" find him tearing off a plethora of blues licks that will have guitar players everywhere eagerly licking their chops, while delicate acoustic numbers such as "Wrapped In Bronze" and "Roraima" reveal another side of his diverse musical palette; think "Mood For A Day" style Steve Howe to get a better idea of what I'm talking about. He ventures out into distinctly more progressive territory on "Flight", a track in which he breaks out the Moog Taurus bass pedals and the Mellotron to really blow the marvelous middle section of the song wide open. The 70's British blues based hard rock sound is explored on "Say What You Will" and "Mofo", two tracks where he definitely goes for a more ballsy, almost Zeppelin-esque sound. Want country style picking and rockabilly? Well Roger's got that covered as well on "Courageous Cat" and "Telekinesis", further proof that nothing is off limits on World's Within. If you're unfamiliar with Roger's work (much like I was before I got hold of this album) then I can't think of a better place to start than right here with World's Within. In this day and age it's rare to come across an album that works so well on so many different levels as what you'll find here. If you're looking for music that is both engaging and full of diversity, not to mention tastefully and flawlessly executed, then look no further because this one has it all.